To drill blast holes as economically as possible, Drill Rigs cover rock cross sections of hundred square meters and more. 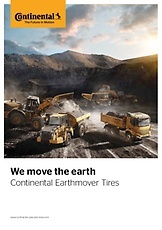 Therefore, the Drills use up to four booms which result in very high tire loads when moving. High cutting resistance, good traction, and stability are essential for tires used in these applications. The tire carcass is designed to stand heavy loads. The innovative zigzag tire tread design offers maximum amount of gripping edges in all directions to manage steep inclination and declination with tight cornering safely.